Experience on the mats as a competitor gave Harold Frey wisdom as a coach. The result: a hall of fame career, world-class athletes and an impressive list of awards, honors and championships. Frey coached at the University of Illinois, Chicago for ten years, collecting three Midwest Open Championships and four undefeated seasons. 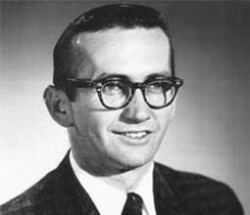 Frey then went on to coach at the University of California, Berkley where he posted an astonishing 13 undefeated seasons, including winning streaks of 89 and 56. At Berkeley, Frey coached two national champions and one world champion. Frey judged for 58 years, scoring meets from NCAAs to the Olympics. His impressive reputation and rapport with those involved in American gymnastics helped him convince those opposed to embrace the switch from AAU to USGF as the governing body for US Gymnastics.